A couple of days back my friend posted this on her website dedicated to dogs, especially strays and abandoned dogs. 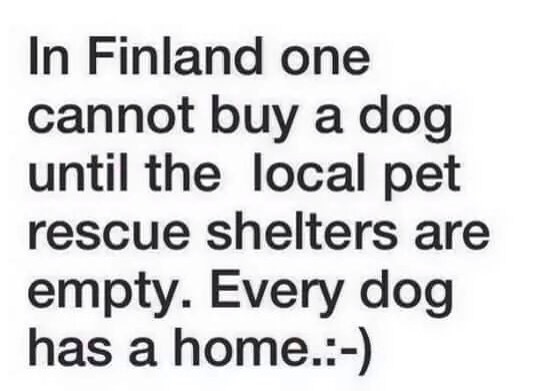 It’s a brilliant thing that Finland has done and heart warming. There are no strays and every dog has a home. Now just imagine if any country could say this for orphans ?…. Imagine the poster that says “In India you cannot have children till every orphan has been adopted”. I understand some people like me don’t want to have children, but those that are making the rounds of the infertility centres and taking on the tough and expensive treatments just to have a biological child …. Why wouldn’t adoption be an option ? No am not equating dogs to children, but the point is just as every dog needs a home, every child needs it too. Why are we able to love a dog unconditionally but not a child ? One of my closest friends and her sisters have biological children of their own but they have also adopted one child each. And let me tell you, the adopted child has adopted their expressions, food habits, mannerisms etc etc so much that if they didn’t say the child was adopted, one wouldn’t know. I know many of my friends who have adopted children and these kids even resemble the parents !!! I admire celebrities like Angelina Jolie – her adoption of babies from strife hit countries does more for peace than the UN peace keeping force. Just imagine if orphans from the North East of India are adopted by Delhiites or Bangaloreans – suddenly you won’t call them names or think they are different. The fact that our PM had helped bring up a Nepali boy has warmed our relationship with Nepal a lot more than all the speeches ever could. Atleast within each country if orphans get homes, the world will be a far better place to live in. Imagine if every child has a home, we will wipe out the need for orphanages, more children will get educated and many of the social ills will be wiped out. Can’t we open our hearts to the greatest miracle we know – a human child ? A child is a bundle of potential and our future … Can’t we just give one child, besides our own, a home and a good upbringing ? Delhi “bewitched” – The broom sweeps ! What Yoga and Louise Hay can do ..